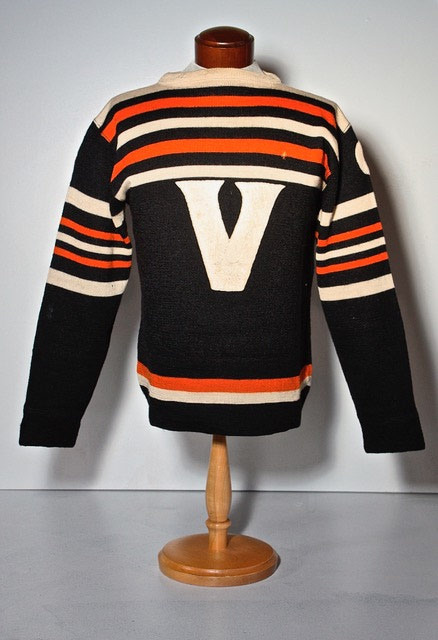 A stunning example of classic barber pole striping and a simple “V” crest adorn this vintage classic from the late 1920’s and short lived professional Victoria Cubs of the Pacific Coast Hockey League. 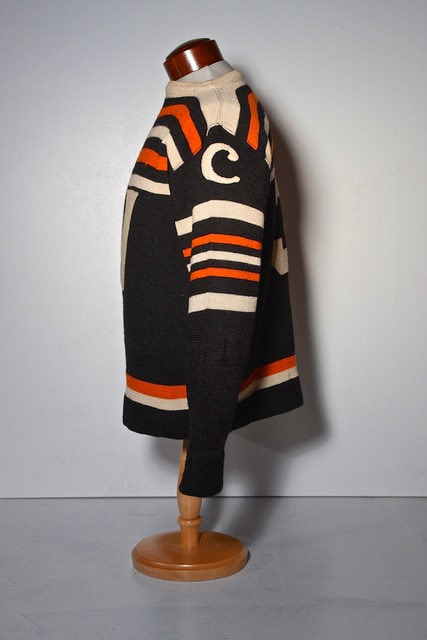 This black wool jersey is in immaculate condition given the age and shows nice team repairs in the black, orange and white areas of wool. The Dominion Knit Winnipeg tag remains sewn into the collar. 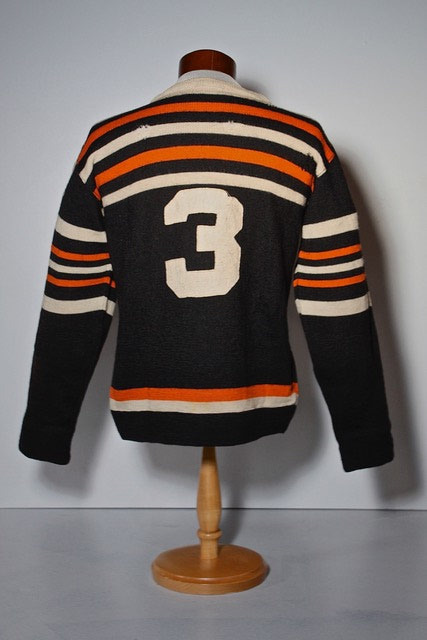 There is a felt "V" crest on the front and # 3 on the back. Also adorning the left arm is a scripted felt "C". It is not known whether this was to represent the "C" in "Cubs" or to indicate "Captain" as it was popular for teams to have the Captain "C" on the arm. The Cubs lasted only two years in 3 year league. The famous Patrick Brothers, Frank and Lester, founded the league and operated franchises in Vancouver and Victoria. The Victoria Cubs’ Arena was destroyed by fire in 1929. Due to the fact the team’s jerseys were lost in the Arena fire, they had to have worn two different styles of jersey for each year. 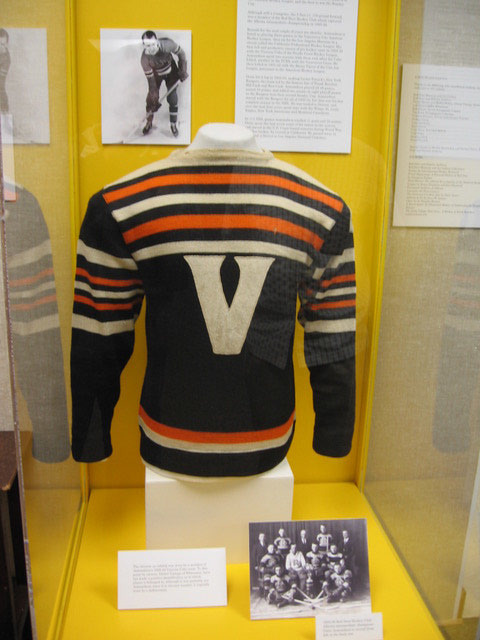 I have not been able to find any images of the team from this year but I did come across an article in the Victoria News paper from November 13, 1929 indicating that the team did in fact get new jerseys. So if this jersey is in fact a Victoria Cubs jersey it is from the second season of 1929-30. This jersey was acquired many years ago from Leland's auction where it was represented as a Victoria Cubs jersey having come from an Estate in Winnipeg Manitoba. Oliver Redpath died in Winnipeg on August 2, 1986.